If you were booking jazz shows in Chicago in the late ’50s, a press release with the following exhortation might have crossed your desk: “Be good to your mind’s mind/eye Earthlings… Give is a chance to do what all Earthlings must do before they cross the River Styx… be bombarded with the living-cosmic-soul-force-vibrations of Sun Ra and his Intergalactic Infinity Arkestra!!!! !” It’s a bold and wildly eccentric pitch for a band to make during the Eisenhower era, or any era. But it also boldly proclaims the unapologetically deep philosophical and musical forces ushered in by one Herman Poole “Sunny” Blount, better known by the name he later chose for himself, Le Sony’r Ra, or Sun Ra. Many fans and curious cultural onlookers first encountered the fringe figure and jazz experimenter as he presented himself: a robed mystic from Saturn. The remarkable thing about Pathways to Unknown Worlds, a new exhibit of Sun Ra ephemera at Chicago's Hyde Park Art Center, is the way it gradually reveals the intense dedication and rigorous reflection that coalesced into Ra's main theories, many of which influenced artists from Parliament to hip-hop producer Madlib and beyond. Space is certainly the place, but Ra’s path to the cosmos intrigues not only because of the ultimate destination but because of the singular way he achieved liftoff. The main portion of the exhibit is a collection recovered from the home of the late Alton Abraham, who John Corbett, one of the exhibit’s curators, had previously interviewed for his 1994 book Extended Play: Sounding Off from John Cage to Dr. Funkenstein. A fellow mystic, Abraham managed Sun Ra’s business affairs under the corporate banner Saturn Research and also was part of Thmei Research, a secret society that the bandleader formed on the South Side of Chicago to study everything from African history and numerology to future technology and the paranormal. The rare art and artifacts, almost all from Abraham’s home, document the period Sun Ra spent in Chicago, when he grew from a composer and arranger to a visionary bandleader of a forward-thinking jazz ensemble. Sketches and album covers dominate, all containing a mix of elemental and futuristic motifs like crashing waves, Egyptian symbols and dime novel sci-fi images. But there’s a lot of philosophical heft behind the images, some of which recall B-movie posters. 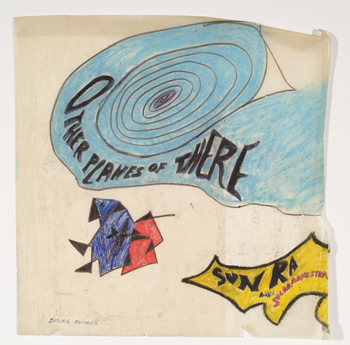 Strewn between the visuals are scores of press releases, record catalogs and wood printing blocks for decorating record sleeves, all evidence of the revolutionary independent business Abraham and Sun Ra were running. According to Corbett, the duo would strike deals with labels to print small runs of records and would make their own covers, all in an effort to spread their beliefs through music. Sun Ra wanted to take his listeners to the space age, but he didn’t mean Sputnik and space stations. As the text and images of this exhibit demonstrate, his seemingly outlandish personal image and artwork were in large part an extension of his belief in self-determination — that we could build our own myths through force of will and inhabit our own space. Sun Ra traveled the spaceways, but Pathways to Unknown Worlds makes it clear more earthly concerns and conceits led to his exodus.